Shut Up Already!! But Key Man wouldn't, so he got DUCK TAPE stapled to his mouth! Tsk tsk tsk, shoulda' had that tape when my kids were little! This weeks Stampotique Designers Challenge is Attachers, and OMG have I seen some FAB ideas on the group posts. Started with some stash, added the bla bla bla'z and it grew from there. 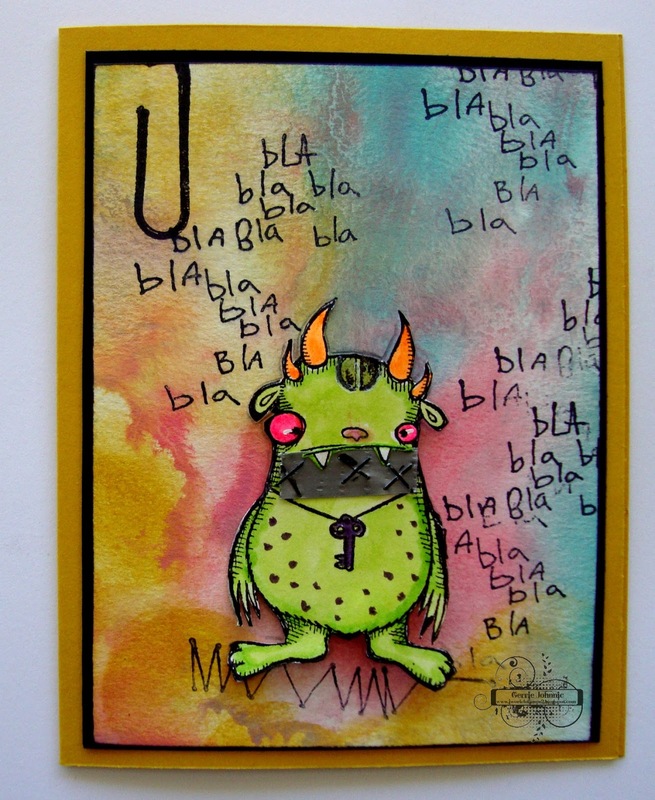 Key Man was stamped, colored and destroyed for being a big mouth. Not only does he have his mouth taped and stapled, he has a screw in his head too! I also added some stitching and a paper clip attacher. Thanks Kathi for a fun challenge. I've been pretty bad about making art lately, but I'm really trying to work on it, so plan on being inundated with art soon. LOL, love that fabulous background and of course your duct tape! Brilliant! So funny that you taped and stapled his mouth! Love it! Can I have some of that tape for a couple of people I know? LOL!!! I absolutely, positively love this delightful piece of art. I especially like that you taped and stapled his mouth, but also added a screw too. I wonder if his screw is loose. Probably, if he's a trash-talkin' motormouth. Thanks so much for playing along with my challenge this week at Stampotique Designers Challenges. Bla, bla, bla and I do love this! Fun and fabulous! Happy Weekend! 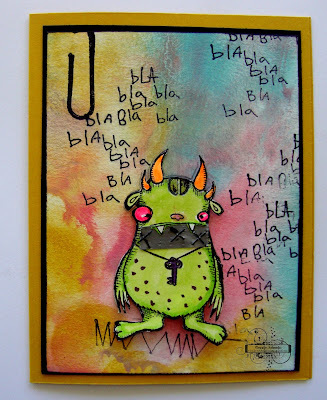 Fabulous card and Bla bla bla, LOVE your colouring here Gerrie, absolutely gorgeous!!! Is it possible to LOL too much?!!!!! If so then I am in trouble! Absolutely love this and cannot get over how fabulous the idea of stapling the tape to his mouth .... it doesn't get any better! This made me laugh out loud ! Very good ! Thanks for joining us over at Stampotique this week ! Poor Key Man you were making sure he didn't talk and a screw in his head oh my.....love this piece and you put a big old smile on my face as I was reading your post....hugs GF. You are a wicked crafter ;-) Such a fun idea and beautiful card !